Unlike, Kaw-Liga, the wooden Indian, Alvis Ferris did fall in love with an Indian maid. Alvis, a fifth great grandson of Jeffrey Ferris, and his offspring brought new blood to a small Northern California tribe at a time when it could have just faded away. Born in 1832 of Samuel Ferris and Sally Spears, Alvis went west from his Michigan home to make his fortune. By 1863 he was hunting for gold and, apparently, hunting for women. For much of the remainder of his life, he lived and mined in Humboldt County, California, among the Native Americans who were his wife’s people. Mary Wiley was a Karuk Indian. Her name may be shown in places as Mary Wiley Tom Karuk Stone. Between 1862 and 1879, she was to bear Alvis six children in her native land. Placer This is on the Klamath River about 1 mile below Orleans. It contains 30 acres of ground and has 500 ft frontage on the river. One mile of ditch collects water from a number of small gulches and delivers about 100 in for three months in the year. There are 600 ft of 9 in pipe and a giant with 4 in nozzle under a 60 ft head and 200 ft of sluices 18 by 18 in with block riffles. A Ferris of Orleans owner. Mr Ferris is doing some sluicing on a bar in the Klamath River at present September 1894. 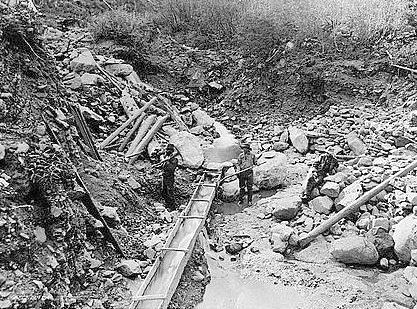 A wooden dump car running on a wooden track is used to run the gravel to the main channel where by an ingenious arrangement of cheap wingdams sufficient water is diverted to fill the sluices and keep them clear. There are 60 ft of 12 by 12 in sluices and about 15 cu yds of material are washed per day. The gravel deposit on bedrock is about 3 ft deep and is said to be renewed every year by deposition of gold and gravel during high water. The Karuk or Karok tribe was never displaced by white settlers. They and several neighboring tribes lived far enough into the wilderness of Northern California that they were able to achieve title to their lands before large scale encroachment occurred. This did not prevent their exposure to white men and their illnesses and the tribe was dwindling in numbers in the last half of the 1800s. Estimates for the pre-contact populations of most native groups in California have varied substantially. Alfred L. Kroeber proposed a population for the Karuk of 1,500 in 1770. Sherburne F. Cook initially estimated it as 2,000, later raising this figure to 2,700. Kroeber reported the surviving population of the Karuk in the year 1910 as 800. My father (Franklin Samuel) and two brothers (Alvirus and Cyrus) left Michigan in the early 1850’s for the gold rush area. Alvirus the older brother married an Indian Maid and raised a family somewhere in California. 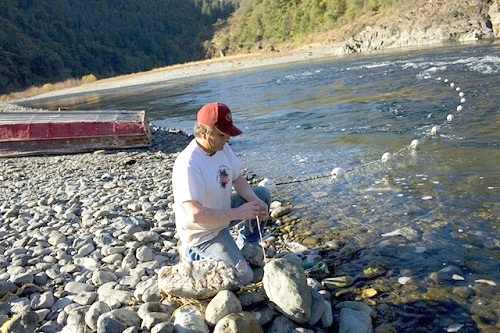 Leonard “Spam” Ferris fishes for salmon with gill nets near the Tish Tang campground in Hoopa on Tuesday. He said his family has been fishing in the same spots on the Trinity river for generations and that the fish are fewer and come up the river later in the year from when he was a child fishing with his grandfather.